This month I learned how to crawl and get into things. I got two bottom teeth and I added da da to my vocabulary. I just started eating food and I love it! I like to laugh at my big brother and I give daddy huge smiles when he gets home from work. Mommy has been nursing me non stop to get my weight up and I now weigh 13lbs 3 ounces! Up more than a pound in a month. The doctor was very happy. I'm still a little peanut, but a very happy and healthy baby. Lately, I really like scooting around on the floor and can get away from my designated blanket area all on my own (and pretty quickly too!). I went for a weigh-in today and sadly, I only gained 6 ounces in 6 weeks and dropped from the 15th % to the 2nd % (12 lbs 1 ounce), so my doctor said I could start cereal a little early. I grew almost another inch in the 6 weeks and the doctor said I am ahead of all of my milestones. She thinks I burn too many calories because I am such an overachiever and do hours of tummy time per day, not just the 20 minutes suggested for my age. I like to babble a lot and say Ma Ma. I'm a little calmer, I sleep a little longer, and I really like to eat my hand and drool a lot. Today, I weighed 10 lbs 3 ounces (20th %) and I was 22 inches long (37th %). I was a little under the weight they were expecting, so they had Mommy feed me and weighed me again to make sure I am getting enough milk from her. I weighed 2.5 ounces more, so they were happy with that. Now she just has to feed me non stop for 2 weeks and we'll go back for a weigh-in. I got out of my shots until next time. Everything else looks right on track. They said I can stand if I want to, which is good news because all I want to do is stand and look around! I like to eat a lot and I like a lot of attention. I don't like to be put down, so I spend a lot of time thrown over Daddy's shoulder like a sack of flour. People think I need the snuggles, but I am really just trying to get the best view of things because I am very nosy. I like to chat with Mommy during diaper changes and I have been working on my smile quite a bit. 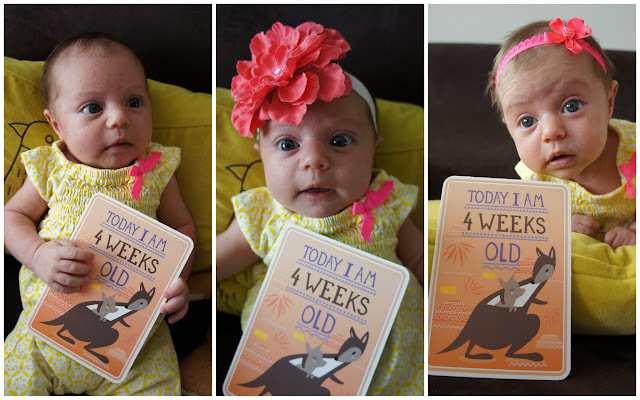 Today, at my 4 week check up I weighed 9 lbs even (52 nd percentile). Shortly after my weigh in I did a giant poop, so I might have been slightly less than that. My brother weighed 8 lbs 15 ounces at his 4 week check up, so we're almost exactly the same. I am very nosy like my Daddy and hold my head up all the time on my own. Today at my 2 week check up I weighed 8 lbs 1 ounce - almost my birth weight.